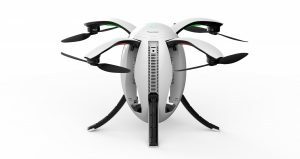 Drone Vibes interview with Wally Zheng, Founder and CEO of PowerVision – we asked Wally about the design, features, and technology behind their newly released PowerEgg Drone. PowerEggTM, the first consumer drone developed by PowerVision Technology Group, a worldwide leader in robotics and big data technologies, is now available for global pre-order. With its unique egg-shaped robotic design and the industry’s first gesture recognition remote control, PowerEgg is the world’s most intuitive drone designed for both enthusiasts and first time drone owners. PowerEgg pre-orders are now being taken here! PowerEgg takes the consumer drone market to the next level with the world’s first gesture-based one-handed drone controller — PowerEgg MaestroTM. With PowerEgg Maestro, takeoff and landing can be done with the push of a button so that anyone can fly PowerEgg right out of the box. The one-handed remote has motion sensing capabilities, allowing the user to interact with and manipulate the drone in flight via gesture recognition through advanced, integrated accelerometers and gyroscopes. Users can control up-down, left-right, and near-far motions.